What is the Gaelic Athlete Online Coaching Program? It used to never bother you. "I'm not that bad. Sure I can still last the full match." "I've tried dieting before and I didn't have the energy to train or play, so there's no point." But recently, you've been covering up the belly a bit more, and you've avoided certain situations where someone might have to see you with your top off. You've noticed yourself unable to keep up with others on the team, and you know getting some weight off would help. The extra laps aren't working. You cut out carbs one time but that zapped your energy and lasted a couple of weeks. You think the fat-burners you saw someone talking about on the internet might be the answer, so you buy them. 4 weeks and £30 later, no change. You're all but ready to give up. Outside of the top teams in the country, the advice on fat-loss, muscle gain and fuelling performance for GAA isn't great. I recognised this when I went looking for some as a Gaelic footballer. I decided to go looking for it in other areas, (Rugby, Athletics, Bodybuilding, NFL etc.) studied, and got qualified in the relevant areas. I realised that other sports were a lot further along in the recommendations available to the athletes involved, and I wanted to take what I'd learnt from them, and apply the information to GAA sports. 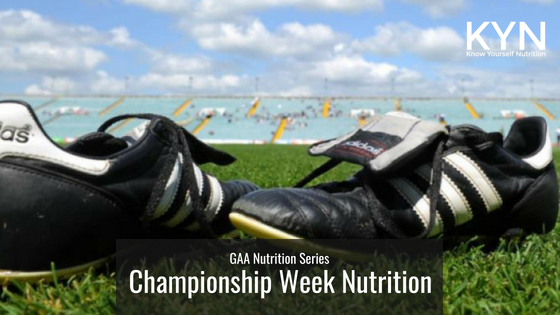 This is a 12- week program where I help GAA Athletes like you, to get in shape whilst fueling performance. This is done through a personalised nutrition plan and gym program, with the weekly accountability and advice to keep you on track. There's a lot of information out there around these topics, but the hard part is putting it all together into a plan in a way that takes your specific physical attributes, training schedule starting point and goals into mind. That's what I do for the athletes that come through this program. And don't let the word 'athlete' put you off. In fact, most of the people that come through the program aren't those that are the high-fliers in the team (we get some of them too, mind you). Often, they're the guys who are trying to go from sub-bench to the starting 15, or the guys who are struggling in training because they've let themselves go a bit. Or the guy who is in the offseason, who wants to be in the best shape possible when pre-season comes around. But what they have in common is that they're ready and willing to improve themselves. They're ready to dedicate some time to their nutrition and gym-work because they know the pay-off it will bring to their performance and life. You've been training hard since January and the league campaign has come and gone. Championship week is upon you, and you want to make sure you're doing everything you can to perform to your best ability. Your training plan for the week will probably consist of a few easy sessions to keep the legs ticking over and keep the skills sharp, as you wind down towards the end of the week, making sure you're as fresh as possible for the weekend. But you know training is only one aspect of optimising your performance, and nutrition is another. The goal in the 7 days leading up to a championship match is to make sure you are fully recovered and prepared for the match, and in order to do that, it's important to focus on the basics. This entails things like making sure you are hydrated, getting enough sleep and making generally good food choices. "Good food choices" means different things for different people. For some people, it might mean only having one chocolate bar instead of three, and for others, it may mean being extra diligent with their calorie intake. Either way, it's important not to bring in any drastic new dietary changes in the week of championship. As well as that, an element of preparation is going to help. It can be valuable to take 15 minutes at the start of the week to plan out your week: when you'll be working, training, sleeping and eating. This will allow you to make any preparation that you need to, whether that is buying food to have on hand on match-day, or making sure you have organised to be finished work on time to get to training early. All these little things will add up and avoid adding to the potential nerves and stress that can come with an important match. This could be as simple as adding in an extra portion of carbohydrates to each meal. For others, who are used to counting their carbohydrate intake, it could mean having a specific number to aim for. Generally, the recommendations for carb-loading are around 8-10g/kg body weight per day, meaning that someone weighing 80kg could be eating up to 800g of carbohydrates per day. However, these recommendations are generally for long-distance athletes, so they are probably higher than needed for GAA athletes. Obviously keeping good habits in place, such as getting enough sleep and rest, as well as keeping hydrated are going to be important in the days before the match. On match-day, in my opinion, the biggest focus is simply on avoiding messing up. I know that may be seen as a negative mindset, but the hard work is done. This can be hard for people to accept and they can feel the need to turn to new foods and supplements that they've never used before. There's been a myth going around for at least 20 years that chicken and pasta is the only acceptable meal to have before a match, and I've worked with people for whom the only time they'd eat chicken and pasta was before a match, despite that fact that it made them feel bloated and lethargic. I've also heard a few disaster stories about pre-workout supplements that were being used on match-day for the first time. The point is to keep things simple on match-day. Stick to familiar foods and supplements that you know are easy to digest. Also, it has been shown that having some carbohydrates in the pre-match meal can, not only improve physical performance, but also mental performance and even things like central nervous system fatigue. This meal can be the usual favourite of chicken and pasta, but it certainly doesn't have to be, and shouldn't be if you don't usually eat it. Again, the caution around trying new things continues right up to the match, and with any of the recommendations here, you should have trialled them previously, either in training or in a less-important match. There are two performance aids we can include in the 30-60 minutes pre-match that have been shown to have a beneficial effect on performance. These are fast-digesting carbohydrates and caffeine. Having some sugary foods or drink (think sports drinks or jelly babies) before (and during) intense exercise increases the availability of glucose for energy production. Given that glucose (a simple carbohydrate) is the primary source of fuel in high-intensity exercise, this can be beneficial. I'd advise limiting caffeine later in the day since it can have a major effect on sleep quality. It's pretty simple when it comes to championship nutrition. Doing the usual things right and making the few subtle changes outlined can go a long way to giving you that extra edge, so that you can go out and focus on performing to your best ability. Have you ever thought about why you eat the amount that you do? On the surface level, it seems like an arbitrary thing. We just accept that a certain amount of food on a plate looks like the right amount, and we don’t tend to question it much further. Yet, even though there is basically an unlimited food supply, we usually manage to control ourselves and not eat everything in sight, and even if we did try to, at some point our bodies would stop us. There are certain processes within the body and certain aspects of our lives that affect how much we eat. A useful way of thinking about these is by splitting them into 2 different types of factors: homeostatic and non-homeostatic. Your body has a huge amount of regulatory processes that attempt to keep it in equilibrium. An easy example would be that when your mouth gets dry, your body produces more saliva, and your mouth returns to an acceptable level of moisture. If you have too much saliva in your mouth, your body won’t produce more until it needs to. It’s a bit like the thermostat in your house’s heating system. You set it at a certain temperature and if it goes below or above that temperature, the heating output will adjust up or down to get the room back to the selected temperature. The regulatory process of keeping these things close to an acceptable level is known as homeostasis, (which is where the term homeostatic comes from) and your body’s drive to stay in homeostasis can be seen in various bodily processes, one such area being its drive to stay at a certain body composition. You can think of the homeostatic bodyfat/bodyweight regulation process as the body’s desire to make sure you have enough energy stores. After all, humans have evolved in an environment where not having enough energy stores might have meant not being able to get away from a wild animal, not being able to hunt, not being able to protect your family and many other dangerous things. Essentially, if you were malnourished, and had insufficient energy stores, you were more likely to die. Your body doesn’t quite like the idea of that, and it does all it can to make sure you don’t let our energy stores (fat) get too low. It is thought that each person has a range of body fat level that the body perceives as safe, and this is sometimes referred to as the individual bodyfat (or bodyweight) set-point. Your body tries to keep you at this set-point in two ways: Firstly, through a short-term mechanism of giving hunger and fullness signals, and secondly through a long-term mechanism, based on hormonal feedback. The short-term mechanism is based on your body first giving you the signal to eat a certain amount of food, through a feeling of hunger. As you eat, the stomach fills up and expands. As this happens, the sensors in the stomach begin to send signals to the brain, based on the caloric content and the volume of food. This tells the brain that you’ve eaten enough to maintain the energy stores that it feels you require. There are other systems at play, that also send the signal to the brain that you’ve had enough food, such as the release of certain hormones, including insulin. The long-term mechanism is essentially based on the amount of body fat that you have. Your fat cells produce a hormone called leptin. The more fat cells you have, the more leptin you produce, all else equal. Using this information, the brain assesses the amount of leptin in the blood, in order to get an idea of how much body fat you have stored. It does this so that it can assess whether you have enough energy stores (fat), or if it thinks you need more, in order to be safe. If it thinks you need more (for example, if you’ve recently lost a lot of fat), it will signal to us that we need more food in each meal, partly by making us hungrier, and also by not making signalling fullness as quickly. It also then has the double-whammy effect of signalling to you to output less energy. The combination of extra desire to eat and a down-regulation of energy output is partly what makes it difficult for most people to lose weight. If you were to listen to our bodies hunger and fullness signals, you would probably just eat as much energy (as many calories) as you need to stay at a good healthy bodyweight, but we know that that doesn’t always happen, as can be seen by the number of overweight people that there are, and this is generally because of factors that aren’t involved in energy requirement, which are known as non-homeostatic factors. As mentioned before, non-homeostatic factors are factors affecting your energy intake that aren’t related to a perceived energy need (or factors that aren’t related to homeostasis). They usually involve some element of eating for pleasure or to manage our emotions. This can also be known as hedonic eating. Non-homeostatic factors are mostly related to what’s known as your food environment. This is essentially how and where food is situated and stored in your surroundings. Again, when we look back at how humans lived 100s and 1000s of years ago, the food environment was very different. In order to get food, you had to hunt it, or harvest it, and that all required energy. So you probably weren’t going to go out and find food, unless you were hungry. Nowadays, our food is so accessible, that what would have taken a lot of time and effort to attain, can now be delivered to your door with a few clicks on our laptop. When it gets into your house, it is now easily within your reach and the likelihood is that whatever is in your house will be eaten, which is mostly true for so-called good quality foods as well as bad quality foods. This is why it is so important to manage your food environment. For example, we know that if the biscuit packet is sitting on the counter-top, on display and you see it every time you walk past, let’s be honest, it won’t be long before it’s gone. However, if it’s sitting in a packet, within a tin, stored in the bottom cupboard, even that small difference can mean you might not bother with it. Non-homeostatic, or hedonic, eating can also affect you when you are out of our usual environment. When you go to a party, and they’re serving really tasty foods, cakes and drinks, you’re probably going to eat some, regardless of whether you’re hungry or not. You don’t want to miss out on the chance of having a pleasant experience of tasty food, plus it’s expected that you’ll eat some, and you don’t want to feel left out. This is also a problem due to the fact that a lot of these foods will be very high in calories, whilst not being filling, meaning that you tend to eat more calories than you would if you were to eat something high in fibre and protein for example. In some ways, this gets around the homeostatic hunger and fullness signalling we talked about earlier. It takes us longer to become satiated by tasty foods, and we tend to not get sick of eating if we have loads of different flavours and types of foods in a meal. Another non-homeostatic factor could simply be the idea of eating out of habit. Maybe that could be having 2 biscuits with your 3 pm tea. Or it could be having ice-cream every evening after dinner. Or maybe you have a fizzy drink after work each day. You probably don’t need these things from an energy point of view, so therefore you aren’t eating them due to homeostatic factors, but rather that you associate them with a certain time of day or an event. These small daily habits can surely lead to overconsumption. Also related to non-homeostatic factors effecting food intake is when we purposely monitor and restrict our food intake. Things like calorie-counting, restricting certain foods or categories of foods, fasting etc, are all examples of things that aren’t really a result of our body’s own signals telling us to eat more or eat less, but instead, we’re stepping in and regulating energy intake ourselves. It could be said that some form of restriction is needed if you want to lose weight, for example. If you are to go with our body’s signals all the time and eat just according to them, you’ll most likely stay the same weight. After all, that is the body’s aim, and that is where it feels ‘safe’. However, when you throw in the odd bit of non-homeostatic eating, you’re likely to slowly gain weight, and most people do. Listen to hunger and fullness signals to maintain a healthy body weight. In order to do so, it can be helpful to be mindful of how you are feeling during a meal. Eating to slightly less than full may be a good idea if weight-loss is a goal. Eating sometimes when not hungry may be a good idea if weight-gain is the goal. For weight-loss, eat high fibre and high-protein foods. These foods tend to be filling, and for a similar quantity of food, are likely to have fewer calories than something less fibrous and less protein-rich. Eat slowly. Eating quickly can allow you to consume more calories, as the stomach takes time to send fullness signals to the brain. For this reason, and other reasons, including improved digestion, it is a good idea for most people to eat slowly. Control your food environment. This could mean not buying food that you know you shouldn’t eat, putting those types of foods out of sight if they are in the house, making them difficult to get to, clearing out your food cupboards and getting rid of the stuff you know you shouldn’t eat, having plenty of healthy foods available at all times by preparing ahead. Track your food intake. It can be useful to track calories or macronutrient intake for a period of time, in order to get an idea of how much you’re currently consuming. In doing so, you know that in order to lose weight, you can reduce your intake slightly, and vice versa to gain weight. If you want to lose weight, find a nutrition plan that creates a calorie deficit, without making you want to chew your arm off. For some people, this will be a low-carb approach, or a vegetarian diet, or a paleo diet, or tracking their calories. If you are trying tot lose weight, you need to be in a caloric deficit. You should probably aim to do this in a way that doesn’t negatively impact your health, and in a way that allows you to still enjoy your life. When going into a fat-loss phase, there is often concern around whether muscle will also be lost. Muscle is difficult to gain for most people, so who wants to lose it when going through a fat-loss phase? Firstly, I should say that the likelihood is that in a fat-loss phase, there may be some muscle loss. But there isn’t always, and even when there is, there are definitely ways of minimising the loss. There are no two ways about it: In order to lose weight, you must be in a caloric deficit, meaning that you are expending more energy (calories) than you are using, and the extent of that caloric deficit determines how quickly you’ll lose weight. So, why not just eat as few calories as possible? Sure, you’ll lose a lot of fat if you do so, but you also run the risk of not being able to perform optimally in GAA training and matches, losing muscle, feeling crap, and eventually not being able to keep it up. Think about it: If you’re hungry and lacking energy all the time, you won’t want to train, you’ll think about and crave food all the time, and you’ll hate the whole process. It’s unnecessary and frankly leads to disaster most of the time. Instead, what we want to do is eat in a way that is allowing us to lose weight whilst not feeling hungry all the time, feel energised in training, and supply our body with enough energy to carry out its biological processes. In order to do so, I would recommend eating in a 10–20% deficit, meaning that someone who maintains their weight at 2500 kcal should eat around 2000–2250 kcal per day. You could go more extreme than that, but doing so can put you closer to that stage of risking muscle loss and the other factors mentioned earlier. One of the main factors that will cause the body to maintain muscle tissue is to regularly put a stress on the muscle, and allow for subsequent recovery. Let’s put this into the evolutionary context. Our bodies have evolved to be survival-oriented machines. When we under-eat, which is essentially what we do when we eat in a caloric deficit, one way in which the body adapts is by using more muscle protein for energy. Fortunately, the body is very adaptable, and one way of thinking about it is that if we signal to the body that it’s going to need muscle in the near future, by strength training in the gym, for example, it is more likely to hold on to muscle tissue. It’s likely that the same training modalities used to gain muscle are the ones that are going to be beneficial for maintaining muscle. That is, progressively overloading mainly compound movements. There’s no need to think you have to change up your training to HIIT training or very high-rep weight training because of its supposed fat-burning effects. Remember, being in a caloric deficit is going to cause your weight-loss, and resistance training is going to be a priority when it comes to maintaining muscle. Our muscle tissue is made primarily of protein. The muscle mass that we have is determined by Muscle breakdown vs. Muscle Synthesis (creation of new muscle). By eating enough protein, we supply the amino acids needed to build new muscle, and we are able to elicit a muscle synthesis response, which skews the MPB vs. MPS equation in our preferred direction. By eating adequate protein, we also allow for recovery from exercise, which means we continue to get on with our strength training in the gym, and elicit that muscle maintenance response we spoke about earlier. Protein sources also tend to be quite filling, which can help when not eating as much food as we’re used to, allowing us to stick to our nutrition plan. Often we make the mistake of taking on extra laps around the field, or “Fat-burning” workouts or hours on the cardio machines, in order to try burn body fat. But if this is replacing our resistance training, we’re missing out on those benefits. Also, if you're already doing a lot of running at training, adding more on top of this is going to add to the stress on the body, creating greater fatigue, and therefore greater recovery requirements. Remember, when it comes to fat loss, eating in a calorie deficit is our main priority. Cardio can help us here, however. Let’s say we expend an extra 300 kcal on a stationary bike. That means that we can eat an extra 300 kcal for that day, and still be within our calorie deficit for the day. However, when we take this too far, we begin to see that it interferes with our resistance training, which is our main training priority, as well as potentially increasing appetite, which obviously isn’t conducive to staying in a caloric deficit. So yes, we can use some extra cardio to elicit an extra caloric deficit, potentially allowing us to eat more, or go into a further deficit, but if that causes our GAA training, resistance training and recovery to suffer, or affects adherence to our nutrition, then it’s probably too much. Obviously there are other advantages to cardiovascular training, but in the context of fat-loss and muscle building, these are the main considerations. This is probably where most people fall down. Progress is never completely linear, so it’s important to do the right things consistently over the long term, in order to ensure we aren’t misinterpreting slow or non-linear progress as lack of progress. Some of the previously mentioned things will help here. Not being in too much of an energy deficit will be better for adherence than a more intense energy deficit. Not adding hours of cardio per week is going to be easier to adhere to than doing hours every day. Eating high-protein foods that keep you full is also likely to lead to better adherence. Also, getting in shape usually takes longer than people think, so setting up with a long-term view is more in line with reality. If we are able to take a long-term view on the situation, perhaps we won’t be disappointed when the scale isn’t moving as we think it should, or when we temporarily go off-side from our nutrition plan. and being consistent and patient. Jack came to me having gotten himself to the point where his usual approach of going the gym, doing some running, and cutting out carbs, was no longer giving him the results he wanted, even though he had previously lost several stone with this approach. We started out with a bit of education around energy balance and how he could include carbohydrates in your diet, and still lose weight, as long as he managed overall energy intake, and that carbohydrates would actually likely help with performance in the gym. We got him to start tracking his food and aiming for a calorie target, followed by protein, fat and carbohydrate targets, and added in recommendations around supplements and step count targets as the weeks went on, along with managing potential problems like birthdays and other social events, as they came up. He lost over a stone in the first 12 weeks on the program and continues to make progress today! You see, this isn’t a 12-week transformation program in the typical sense, but instead, the education along the way allows for continued progress, where a final ‘after’ photo doesn’t really exist, as there is no final product where the human body or performance is concerned. Go to knowyourselfnutrition.com/coaching to apply! I’ve read a lot of cookbooks. “Add a pinch of saffron, 3 bay leaves and a star anise to your organic homemade bone broth..."
them. Plus we all know the more dirty dishes there are, the more we think negatively about the cooking process. chef. We just want something tasty and healthy that we can throw together instead of going to the nearest deli-counter. Back in my university days, my house-mate and I used to come in from training, starving and wanting something that would satisfy our taste buds, while giving us the protein and carbohydrates we needed after a tough session. We would get a full chicken, a bag of baby potatoes and some veg, throw it all on an oven tray with some spices and throw it in the oven for 90 minutes, giving us enough time to get the dirty clothes in the wash and get ourselves cleaned up. We tucked into half a chicken and half a bag of baby potatoes each, with a nice helping of veggies. Place your chicken or chicken fillets in the middle of the oven tray. Sprinkle the thyme, chilli powder and lemon over the top and massage it into the chicken. Place baby boil potatoes and carrots around the outside of the chicken and sprinkle some salt and pepper over the top. Put in the oven for about 75-90 mins (for full chicken) or 35 minutes (for chicken fillets) at 190 degrees, adding the broccoli to the tray with about 15 minutes to go. Make sure the chicken juices run clear and the chicken is cooked throughout. If using chicken fillets, you may want to take the chicken fillets and broccoli out and let the potatoes cook for another 10-15 minutes. Or better yet, let the potatoes cook on their own for 20 minutes before adding the chicken and broccoli. I make this dish usually once per week. Twice if I have other people round to the house for food. It can be done in a pan or a pot as outlined below, but if you really want to bring the flavours out, it's hard to beat the slow cooker. Mix the minced beef with the spices (paprika, chilli flakes, cumin, chopped garlic, salt, pepper). Chop the peppers and red onions, chop some carrots in small cubes, and add to a pan or pot at medium heat, with a small amount of oil and fry until the onions have turned soft. Add the seasoned minced beef to the pan. Let the mixture bubble away for about 25 minutes, or until the water has evaporated from the mixture. Serve with some microwaveable rice and avocado, or serve with some spaghetti for a spicy bolognese! I think came across this recipe whilst looking for alternatives to the usual pancake mix, on a pancake Tuesday. But they then became a staple of my diet, when I realised that it was basically a combination of the foods I was already having for breakfast each day. If I need to get some extra calories, I 1.5x the ingredients and add some extra toppings! Add eggs and a banana to a jug and blend together. Add oats to the mixture and blend. Keep adding oats and blending until the mixture is thick enough that it’s slow to pour. Put a small knob of butter on a medium heat pan. Add some of the mixture to the pan and cook until the bottom is brown and then flip and do the same on the other side. This mixture makes 2 small pancakes or one big one. The idea of beefing up for the winter and cutting down for the summer is relatively common among not only GAA athletes, but also among gym-goers. I suppose the idea for GAA Athletes is that they want to be in their best physical shape for championship time, and the average gym-goer wants to look their best on the beach in summer time. You can't blame them. On the face of it, this makes sense. But it can be taken too far. How often have we turned up for pre-season out of shape, and spent right up to championship trying to play catch-up? Along with that, we have different goals at different times in the season. Around championship, it's all about performance, as winning the games tends to be our biggest goal, whereas in pre-season, maybe we're thinking more about making sure we're ready for the league campaign. Here's how to approach each part of the season. The off-season tends to be one of the most wasted times of the year. Due to there being no team training, it's often a time where we can let everything else go by the way-side, with nutrition going out the window, and alcohol consumption often increasing. However, if we change our mindset to seeing it as a time to get ahead of the pack, or simply set ourselves up well for the best season possible, this time can be extremely effective and change the trajectory of your season. This time of the season should be (in my opinion) a time for focussing almost exclusively on getting some muscle and strength on, or getting some fat off, or a combination of both, especially if you feel one of these is holding you back. You can afford to be a bit more aggressive with your goals at this time. For example, if you are trying to lose fat, you can allow for more of a calorie deficit than your should in season, due to not having to worry about performance on the pitch suffering. Often, pre-season is seen as a time for getting back into shape, but as a previous manager put it to me, "You should show for pre-season fit and ready to go." By this, I think he meant that you shouldn't be using pre-season as a means of getting up to base-line fitness or getting into shape ("running off the winter weight"). Instead, you should show up for it in good shape, and with a baseline of fitness, so that it can be used effectively to get you up to pace for matches, working on not only accelerating fitness, but also on getting skills up to scratch, working on team-work, and still making some small body composition progress, whether that be slowly losing some fat, or building some more muscle and strength. During this period, you can still have a focus on improving body composition, but with the tough pre-season sessions, fuelling starts to become a focus. This can also be a time to start developing good nutritional habits, structuring meals around the training schedule for example, so that when it comes to league time, this isn't an issue. As we move through the season, body composition should become less of a focus. Firstly, because we should have made a good bit of progress throughout the off-season and pre-season, but also because fuelling performance becomes more and more important. During the league, time should be spent on continuing to develop good habits, but also on starting to perhaps experiment with some more advanced fuelling strategies around games, so that when it comes to championship time we're able to give it our best shot, knowing what meals and meal timings work best for us around training and matches. Although performance becomes more important around this time, it's still important to continue making small improvements in, or at least maintaing, body composition, since this will likely have an effect on performance. The championship is all about performance. Now that doesn't mean we let body composition fall by the wayside, since body composition can have an effect on performance. However, we do want to have performance as the priority. Trying to lose weight or gain weight around these times is likely not going to be optimal for performance and recovery. As well as that, you've been working on getting yourself into shape all season, so you should be where you need to be in that regard. I've dealt with people who were told by manager 4 weeks before championship that they needed to lose half a stone. It didn't work out well! As you transition from the end of one season into the off-season of another, it's important not to undo all the hard work you've done throughout the season. Of course, you might want to go out a bit and enjoy yourself and let nutrition become less of a priority for a while but do you really want to lose the progress you've made during the season? Imagine you could build on that progress during the off-season, meaning going into pre-season as fit and in better shape than you were in the previous championship and building on that throughout the season. Keep that going for 3-4 seasons and you're a completely different player! You don't have to gain a load of fat in the off-season and spend all season playing catch-up. Whatever part of the season you're at, nutrition is important, albeit for different reasons. However, when we go to either extreme of exercise intensity, such as long, slower, less intense bouts of exercise, or short, extremely intense bouts, carbohydrates aren’t always sufficient to do the job. Let’s take something like a marathon, for example. Although carbohydrates can be stored in the body in amounts that are enough to optimally fuel something the length and intensity of a football match, we usually can’t store enough carbohydrates to produce the amount of energy (or ATP) needed for something like a marathon, which can last for 3–4 times the length of football match. In this case, our body will also need to further utilise it’s fat stores (in addition to the carbohydrates). Fat produces more ATP than Carbohydrates, but it also produces it at a slower rate, hence it would be better used for something like a marathon, but wouldn’t be suitable to higher intensity activities, where fat would be unable to replace used ATP at a high enough rate. In sporting terms, this is easily seen by going for a sprint and observing the point where you begin to slow down. Or if you go for a few repetitive jumps and observe the point where you are no longer able to jump as high as the first few jumps. Before going on, it is worth noting that these systems don’t work independently. They are all operating at once, in differing amounts. For example, even in a marathon event, where fat may be the predominant fuel source, carbohydrates will also still be being used, and the same goes for the phosphocreatine system. So Why Would We Supplement With it? Although creatine can be produced in the body and consumed through food, the amounts that we can get in these ways isn’t close to what we can get in supplemental form, and up to a certain point, the extra creatine that we can get from supplemental creatine is beneficial. Essentially, it’s very difficult to get enough creatine from food and our body’s own production, to attain the benefits that we can get from supplementation. In What Ways is it Beneficial? From what we’ve gone through today, you may be thinking that you should be taking it before the type of activities that it improves, but it doesn’t work in this short-term way, in the way that something like caffeine might do. It takes weeks for creatine to saturate the cells. For that reason, the time of day you take it is largely unimportant, so I usually recommend simply taking it at a time where you’ll remember to take it daily, so if you usually have a shake after training, then you can simply mix it in. If you usually take supplements first thing in the morning, then adding in your creatine here could be an easy way to remember to take it. So you couldn’t be bothered tacking every gram of chicken and rice that passes your lips. I get it. That said, usually these people have developed a set of habits that allow them to get close to their optimal intake, whether they mean to or not! There is more than one way to skin a cat. Tracking your macronutrient intake is one method of managing it and it's usually the one I recommend on my GAA Online Coaching Program (knowyourselfnutrition.com/gaaleanathlete), but if this isn’t sustainable for the individual, then other options are available, and should be used. Remember, following an 80% optimal plan consistently is better than having a 100% optimal plan and not sticking to it! With that in mind, let’s get into some of the other options that are available to you. The most important nutritional concept when it comes to body composition and performance is energy balance. In eating less energy (or in other words, fewer calories) than you are expending, a calorie deficit is created, which will lead to weight-loss and potentially a detriment to performance. Depending on your goals, these two things can be weighed up and balanced in order to allow for slow weight-loss and minimal loss of performance. The inverse is also the case, where a calorie surplus, whilst providing enough energy to fuel performance, will lead to weight gain, which may be good or bad, depending on your goals, and whether the weight gain is in the form of muscle or fat. In tracking your caloric intake, and making sure it is in the right place, you ensure that your performance is fuelled, whilst allowing you to make body composition changes, where needed. When we’ve taken care of our energy demands, the next step is to begin optimising macronutrient intake, firstly by ensuring we are getting sufficient protein intake in order to facilitate the recovery of muscle tissue. By tracking both calories and protein, you are providing the body with enough energy, as well as enough protein for recovery. The potential downside is that you may not be optimising the energy sources since carbohydrate vs. fat intake is not being optimised. The only accurate way of doing this is to track all 3 macronutrients, so, as with all the alternatives in this article, some accuracy will be lost, and therefore progress may not be completely optimal. Again, its about being as optimal as you can, without making it so complex as to cause poor adherence. Since, as mentioned before, energy balance is correlated with changes in bodyweight, by simply tracking bodyweight, we will be able to adjust our daily intake in accordance with bodyweight changes. In this case, since calories aren’t being tracked, the increase or decrease in intake will be done subjectively (eating ‘less’ as opposed to ‘100 kcal less’), in order to push our bodyweight in the direction we want to go, if body composition changes are a goal. On the other hand, for someone is optimising for performance, if bodyweight is decreasing, this may be a sign that they are not providing enough fuel for the training they are doing and therefore, they may need to increase their intake and focus on ‘eating more’. I suggest tracking protein along with bodyweight, since bodyweight is only indicative of weight lost and not necessarily whether that weight is coming from fat or muscle. By consuming enough protein, there will be a better chance of muscle being repaired and maintained, and therefore there is a better chance that any weight lost will be in the form of fat (provided that fat-loss is the goal obviously). This is especially important, since usually protein is the macronutrient that is under-consumed. This is a method I learned when going through Mike Vacanti’s online coaching program. Even though I was going to be tracking my intake during the coaching process, Mike set me a homework task of putting together what a perfect day of eating would look like based on my recommended intake. This forced me to think about what foods and quantities of food I would have to eat to meet my intake, and also forced me to create an eating schedule that would fit around my life. I found this exercise very beneficial, since it saved me thinking-time before putting together each meal, having already planned them beforehand during the exercise. This method could be used to simply create your own perfect day of eating, and stick to that as a meal plan. The danger here is the lack of flexibility. However, this can be helped by simply creating two perfect days of eating, where the meals are interchangeable. The obvious downside here is that there is a couple of hours of work required in the short term in order to come up with your ‘perfect day’. However, I do feel like this is very much worth it, whether you are planning on tracking your macronutrient intake, using any of the above variations, or simply using it to create a meal plan for yourself. A funny thing I’ve found with myself and some of the clients I’ve worked with is that after a couple of months of tracking intake diligently, one begins to develop an intuitive sense of how many calories and/or grams of each macronutrient might be within a meal. When you get to this point, it may be worth experimenting with not tracking for a period of time, whilst using your learned awareness of what’s contained within your food, and observing if you are making progress in the same way you would be with tracking. For some people, this abandonment of tracking is a relief, and if they can make progress without tracking, then it is a real advantage, saving time and hassle on a daily basis. Then there are other people who would rather have some numbers to refer in order to ensure they are close to their recommendations. The downside here is that it can take a few months of tracking intake everyday in order to develop this ‘intuition’. The other potential downside is the loss of accuracy that is the case in all of the alternatives. But as I said before, the imperfect plan carried out is better than the perfect plan not carried out. Making rules can also be an effective method of making sure you are close to your recommended intake. I’ve outlined some example rules below, but there will certainly be others that work. These are just examples of what might work for some people, but are, by no means, meant as recommendations to everyone! All of the above can be effective ways of controlling calories, either in cases of weight-loss, muscle gain and/or fuelling performance. Confusion often ensues when people confuse correlation with causation. For example, if someone sees weight-loss results by keeping their carbohydrate intake to night-time only, they may mistakenly say that eating carbohydrates during the day leads to weight-gain, when in fact, limiting their carbohydrates during the day may have just meant they stayed away from the donuts at tea-time, and opted for salad instead of pasta at lunch-time. This change may have, in turn, created a caloric deficit, and therefore led to fat-loss. As mentioned in other articles, for those whose goals necessitate them being as accurate as possible, tracking macronutrients is probably the way to go, but for those who don’t need to be that accurate, or are simply tired of tracking, but still want some accuracy, the methods outlined in this article presents some decent options, of varying utility and accuracy. It’s worth experimenting in order to discover what works for you. The aim is to find a method that gives you enough control to achieve your goals, without being so complex, or time-intensive as to lead to you not sticking to it for the long-term. Does Eating Fat Make You Burn More Fat? Bulletproof Coffee: A special blend of black coffee, butter and MCT Oil. A.k.a. Coffee with lots of fat. You've probably heard of it, and wondered what all the fuss is about. It is said to keep your hunger at bay ’til lunch, keep you super-focussed, and put your body into a "fat-burning state". This is just one example of the many high-fat foods that some people claim have “fat-burning” properties. Some people claim that eating these foods increases the body’s use of fat as energy, and therefore leads to body fat reduction. For me, this is an issue of semantics (i.e. the meaning of words). It's important not to confuse “being in a fat-burning state” with “losing body fat”. These are two different things. One relates to the body using fat as a fuel source for your activity, and the other relates to reducing body fat over the period of weeks and months. As I mentioned, these are not necessarily the same thing. The food we consume contains energy (which is measured in calories). If we consume too much food, regardless of which of the three macronutrients it is from (protein, fats or carbohydrates), we are essentially giving our body more energy than it needs to do what it needs to do. When this happens, the excess energy is stored within the body, potentially as fat. If we consistently overeat, and give our body excess energy, we slowly build up more and more body fat. The opposite is also true, where if we eat fewer calories than we need, the body will turn to that energy store (body fat) in order create energy to do what it needs to do. This is one of the over-arching principles in body composition, and can be said like this: Eating in a calorie surplus, which is eating more calories than the body uses, will lead to weight gain, and eating in a calorie deficit, which is eating fewer calories than the body uses, will lead to weight loss. So What About Eating Fat Making You Burn More Fat? Your body is is an adaptable system. If you feed your body fat, it will use it to produce energy. By the same token, if you feed it carbohydrates, it will use that to produce energy. Even protein that is consumed can be used to produce energy (although it is used much less to do so). So saying that you will go into “fat-burning” mode when you eat fat simply means your body will adapt to use more fat to create energy, and is the same thing as saying when you eat carbohydrates, you go into “carbohydrate-burning” mode. In fact, both these statements are kinda true. The problem is, whilst you may be burning more fat, you've also just eaten more fat, and if you've burned the same amount as you've consumed, the net effect is that your bodyfat stays the same. Therefore, it is quite misleading, to say that eating fat makes you burn fat, because most people presume this to mean burning body fat. So Can You Lose Body Fat on a high Fat Diet? Will it Help at All? Yes, you can lose body fat on a high-fat diet, presuming you are eating in a calorie deficit. Eating a high-fat diet may help you lose body fat, if you enjoy eating high-fat foods, you feel good eating them, and it helps you to stay in a calorie deficit. Can you lose body fat on a low fat diet? Yes, presuming you are in a calorie deficit. I would still recommend not taking fat levels any lower than 20-25% of caloric intake, due to their use in many biological processes in the body. The proportion of fats vs. carbohydrates you chose to eat largely comes down to individual preference. If you feel good eating a diet higher in fats, do that, and vice versa for carbohydrates. The likelihood is you’ll be somewhere in between. There are circumstances where people will want to go into a very high fat diet, such as a ketogenic diet, where most of their calories come from fat, and almost none comes from carbohydrates. This is usually in very specific conditions, such as certain diseases. It isn't recommended for GAA athletes, particularly in season, where performance is a priority. Going too low in carbohydrates could lead to poor training energy levels, since Gaelic games are very much glycolytic (carbohydrate-reliant) activities. 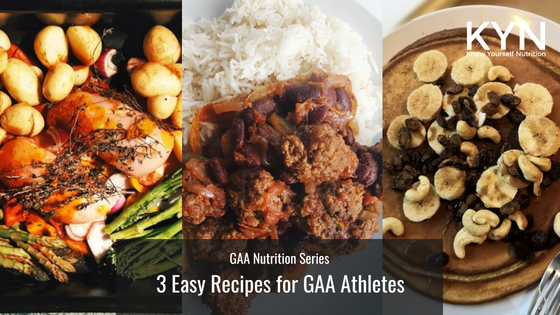 I generally advise GAA athletes to tend towards a more higher-carbohydrate diet, whilst still keeping fats to a minimum of about 20%-25% of the calories in the diet. (Side note: protein needs to be at an adequate level, before considering fat and carbohydrate intake. A level of about 2g of protein per kg of bodyweight per day is recommended). So what about Bulletproof Coffee then? Well, if you feel the supposed benefits on brain function, cognition, hunger levels etc, then sure, be my guest, but if you think adding an extra 300–400 calories to your coffee is going to burn off that layer of fat covering your abs, you may be mistaken, unless it’s somehow making it easier for you to maintain a calorie deficit. But anyway, who’d want to ruin a good cup of coffee like that?